How far would you go for love? That’s the question at the heart of Stephen Dolginoff’s award-winning dark musical Thrill Me, which opens at the Tristan Bates Theatre on 5 April after taking the USA by storm. to a brutal crime in Chicago, 1924, that shocked the world. Their trial inspired the play Never the Sinner, by John Logan, and formed the basis for Rope, Alfred Hitchcock’s taut 1948 thriller. 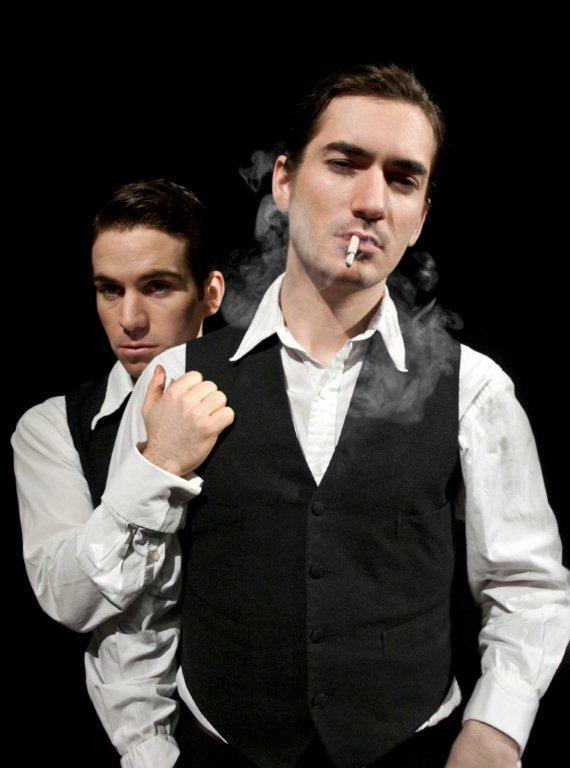 Directed by Guy Retallack (whose recent credits include Drowning on Dry Land at Jermyn Street Theatre), Thrill Me stars George Maguire as Richard Loeb and Jye Frasca, fresh from his role as Joe Pesci in the West End’s Jersey Boys (where he also played Frankie Valli on numerous occasions), as Nathan Leopold. On behalf of OffWestEnd.com, Tom Wicker met with Retallack, Maguire, Frasca, producer Rob Harris and musical director David Keefe to discuss what had attracted them to Thrill Me in the first place and why people should book their tickets to see it now. Tom Wicker: The story of Leopold and Loeb has been made famous by directors such as Alfred Hitchcock in films such as Rope. Does Thrill Me differ in any way? What would you say it is about? Guy Retallack: I hope audiences don’t have too many preconceptions about what they think they know or may not know about Leopold and Loeb. I’d seen Rope and I’ve subsequently watched the film by Michael Haneke, Funny Games, which follows the same story. There’s also Never the Sinner, the stage-play, and Orson Welles’s Compulsion, which is based on the whole story of Leopold and Loeb. But the first time I read Thrill Me, what really drew me in was their relationship. That’s the fundamental thing. George Maguire: Rope was loosely based on the story whereas, although Thrill Me is fictionalised in certain areas, it’s a more real portrayal of, a focused look at, these two people – why they did what they did and their attitude towards society at the time. Rob Harris: I think that it’s important to clarify that there were a lot of differences between Rope and the actual historical case. But although Thrill Me is very close to what happened, it’s important to Stephen Dolginoff that it isn’t seen completely as fact. There are still certain points where he’s had to use his imagination. I’ve had a fascination with Leopold and Loeb ever since I first read about them. When I first came across this piece it literally thrilled me from the start. It’s about an obsession. It questions the inner human mind. How far if you really loved someone would you go? If someone is making you feel so good about yourself and gives you what you need, what would you do to keep their attention? Jye Frasca: I think that Thrill Me really questions how functional or dysfunctional friendships can be. Because with these two guys, I don’t believe that they think they’re doing anything that isn’t normal until the realisation hits much later on. We’ve all had friends we get crazy around and do things we wouldn’t naturally do without them. So I think it’s really interesting to explore that. TW: What attracted you to Thrill Me in the first place? GM: I’ve always been fascinated by criminal psychology and I read true crime books. I should add that I don’t think of myself as a criminal mastermind! But, yeah, I’m definitely interested in the human mind. I could pick up this pencil [from the table in front of him] and stab myself in the leg but I don’t. We could all do atrocious things. It’s that fine line between what people actually do and what they’re capable of doing that’s fascinating. The chance to play someone like Richard Loeb, with that sort of mindset, is a huge opportunity as well as a challenge. JF: I was attracted to Thrill Me when I got sent the script because, to me, even though it’s a musical it reads like a play. I was attracted to the project as a whole because I’ve done commercial theatre all of my life and I was really interested in working on a piece that wasn’t on that kind of scale. Nathan Leopold is just like no one else I ever thought I’d get to play. He’s very far removed from me but then, in some respects, very close to me. So it’s been interesting to find that happy medium. Also, when I actually came in to audition and George and I read together, that made me think that if I got the part I’d like to do it, because I thought it would be great to work with him. GM: We just clicked. It’s a strange thing, you just meet and then you’re chucked in and you’re playing this deep, dark intense relationship. And the chance to do a two-hander is great. TW: Why do you think the story of Leopold and Loeb works as a musical? GR: The thing about Leopold and Loeb is that they lived at an incredibly intense level. Everything’s heightened and rarefied. They were both extremely wealthy and very well educated; I mean, both boys had been to and finished university by the age of 18 or 19. They had everything. So it’s an extraordinary moment when they meet and click in Thrill Me. What I think the music does is to take them emotionally somewhere that words alone just can’t do; it reflects and heightens the level of excitement and passion these two boys find themselves in. JF: I’ve just come from three years of Jersey Boys and even though it’s classed as a jukebox musical, the script is extremely clever. It’s like a play that happens to have music because those guys just happened to be in a band. Thrill Me has a similar feel with respect to the script. It’s brilliantly written. The music is exciting but it empowers the story. It can change from being subtle, from showing our characters’ inner depth, to a flourish of thrillingness on top of the exciting parts. GM: You know, reading the script, it’s quite rare to find a musical where the scenes are more than just nice links between songs. But Thrill Me really stands up. These guys love language, so it makes sense. It’s “delicious”, to use a Guy Retallack word! The music, the piano, really is like another character speaking the unspoken. It’s not just an accompaniment; it’s a whole lot more than that. David Keefe: I think the relationship between the play and the music is definitely symbiotic. The tension throughout the whole piece never really dips and that’s partly because of the music. There’s only about ten minutes without any kind of underscoring or any kind of song. I think that’s the important thing. The fact that they break into song is never actually a surprise. TW: What is your opinion of off-West End theatre? What does it offer? GM: Something that I’ve always found appealing with the fringe is that it’s not necessarily about the size of the venue, but the intimacy and connection you’re able to make with an audience. That’s not to say you can’t get these things in the West End, but there you’ve also got an orchestra pit, the stalls and so on. When people come to see Thrill Me at the Tristan Bates they’ll enter the world of the play; they’ll be there almost claustrophobically with us. That’s an experience I don’t think you could get with somewhere like the London Palladium. RH: If you want to do a great big revival of Oklahoma then you’ve got the audiences and the guaranteed producers who’ll put it on. One of the things with a show like Thrill Me is that there’s such an audience now for new musicals and new writing but I don’t think that, financially, a producer would take a risk on this in a big-sized venue. Put simply, if you can get an audience and bums on seats with Oklahoma, it’s just a safer bet – the economy being what it is. So, from my point of view as a producer, somewhere like the Tristan Bates, or a 70-seat theatre, is great for a production like Thrill Me. You could go up to 400 seats but there’s a limit. There’s something you’ve got to have, an involvement with the actors, because you’re looking to be drawn into a relationship. In a large sized venue you’d lose that. JF: I think that doing Thrill Me at the Tristan Bates is going to enable audiences to feel like they’re in on the action. It will allow every single person in any seat to come on that journey with us. What’s wonderful, though, is that I think it could easily work in one of the playhouses on, you know, Shaftesbury Avenue because it deals with big emotions. Because it’s a musical as opposed to a play, even the lows are heightened. TW: What do you hope audiences will get out of seeing Thrill Me? GM: I’d quite like people to be educated about these people who really lived; I think it’ll be great for audiences to come and learn about something they didn’t know about before. GR: Stephen has really done his research into these two characters; he’s produced something extraordinary. I think that at the heart of Thrill Me is that no one knows the absolute truth of what happens. If you read Nathan Leopold’s autobiography, he won’t talk about the actual event. So there’s an enduring mystery. This, plus the hybrid of play and musical, is what makes this piece unique. I hope audiences will be challenged. Although Leopold and Loeb think of themselves as unique, I’d like people to come away with a sense that the capacity to get closer and closer to doing something terrible is in all of us. I’d like Thrill Me to be darkly entertaining but to resonate at the same time.